Shot of locals and tourists walking and shopping in Venice. 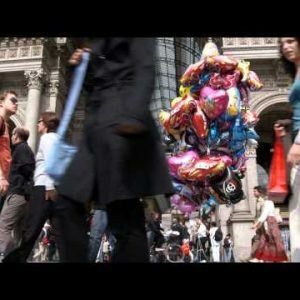 - Stock Footage, Inc.
Home Italy Shot of locals and tourists walking and shopping in Venice. Tags: attraction, bag, busy, buying, city, colorful, colors, crowd, crowded, diversity, dress, europe, european, exterior, fashion, happy, human, italian, italy, life, many, market, marketplace, men, moving, narrow, outdoors, pedestrian, People, retail, rush, shop, shopping, sightseeing, speed, square, stone, store, street, style, tourism, touristic, tourists, travel, vacation, venice, view, walk, walking, woman. Crowd of people walking in Venice. A Booth in the background is selling purses and hats. The crowd is a mixture of tourists and locals. Many are wearing sunglasses and backpacks. Captured on May 1, 2012. Royalty Free Stock Footage of Plaza at sunset in Bologna Italy.